Here’s an album I haven’t thought much about since I bought it a couple of years ago. But like many of my “forgotten” CDs, it’s a consistently rewarding listen. Robyn is a Swedish performer who had some success internationally in the late 90s as a teenager. She fell off the map after that early success and eventually made her comeback in 2005 by forming her own label and releasing a self-titled album. The new material had an electro-pop and hip hop feel to it and was reportedly influenced by Madonna’s later work. It received a U.S. release in 2008, which is when it came to my attention. This has been a great year for new music — especially new music by women. As I write this, five of my top ten 2008 CD’s are by women and most of those are first or second albums. Years ago I was accused of not listening to many female artists. I had some old standbys by Carole King and Carly Simon that had mostly been inherited from my parents plus a Tracy Chapman or two, but otherwise my collection was distinctly lacking in estrogen. 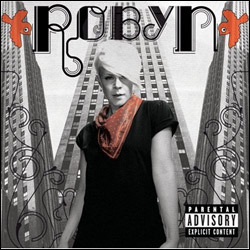 Continuing the theme of one-named women from foreign lands, we jump from Duffy to Robyn. Robyn is a Swedish pop star who wrestled with record execs who weren’t happy with her new direction, bought out her contract and started her own label. This self-titled album was released in Sweden a year or so ago but reached U.S. shores just last month. Her story reminds me a bit of Aimee Mann, who was entangled in record comapny meddling after early success with ‘Til Tuesday only to launch her own label and self-release her more ambitious solo work. Robyn isn’t in Mann’s league, but she’s crafted a very good album.